Artisanal Syrup Bottles. Les Charlatans. Photo Esther Szeben. 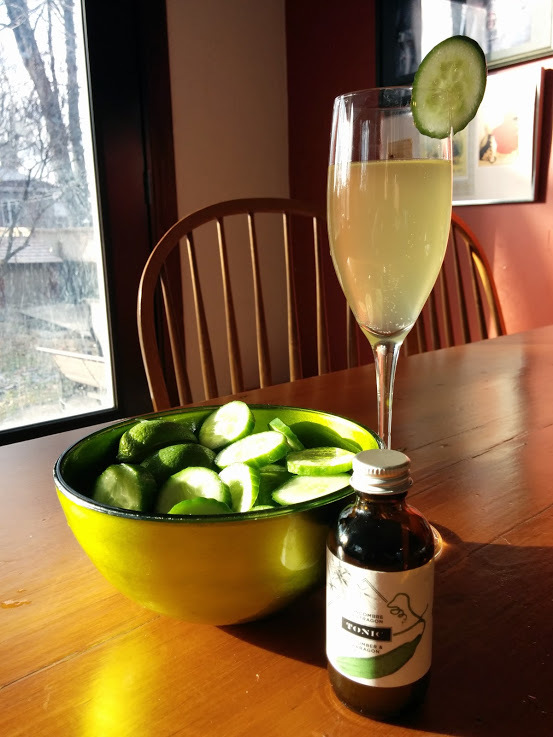 Jeanne Boucharlat, artisanal cocktail syrup maker is not only clever at devising a playful product label based on her family name and the genre of product she sells. She is also a very talented mixologist when it comes to developing unique flavours for cocktails and food. Originally from France, Boucharlat, a foodie, has been in Montreal twelve years and over the last two years has been perfecting her creations which will be on sale this week-end at Souk@Sat and in December at Puces Pop. 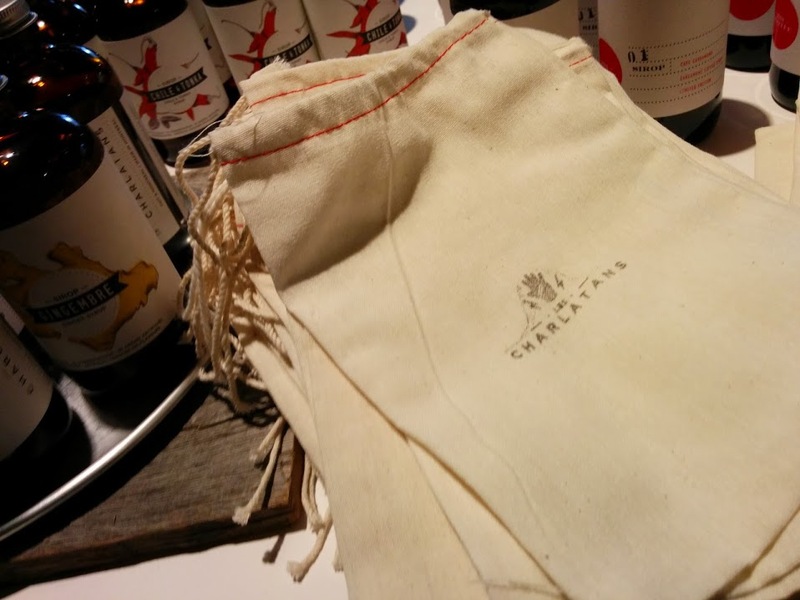 They make great gifts for your bartending friends, and great to have on hand when entertaining. 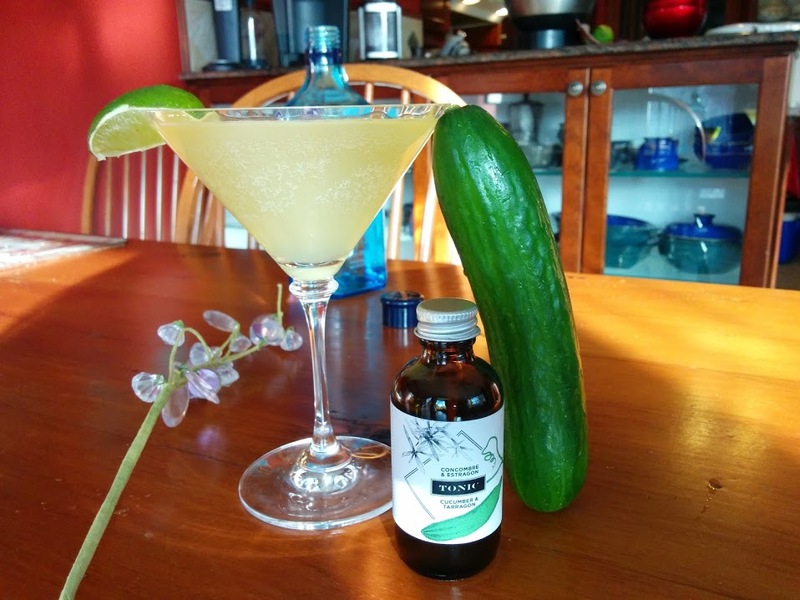 Her line of syrups are made with natural ingredients. Take her “prescription” for ginger ale: an ounce of her highly concentrated Ginger Syrup added to carbonated water will give you the freshest, sweetest ginger beverage without being too pasty for the palate like the conventional ones sold in the soft drink aisles. I took her advice and mixed it in with my mirin, rice vinegar and soy sauce for an Asian-styled tofu stir-fry. Just add it at the end of the heating process as high heat may temper the flavours. 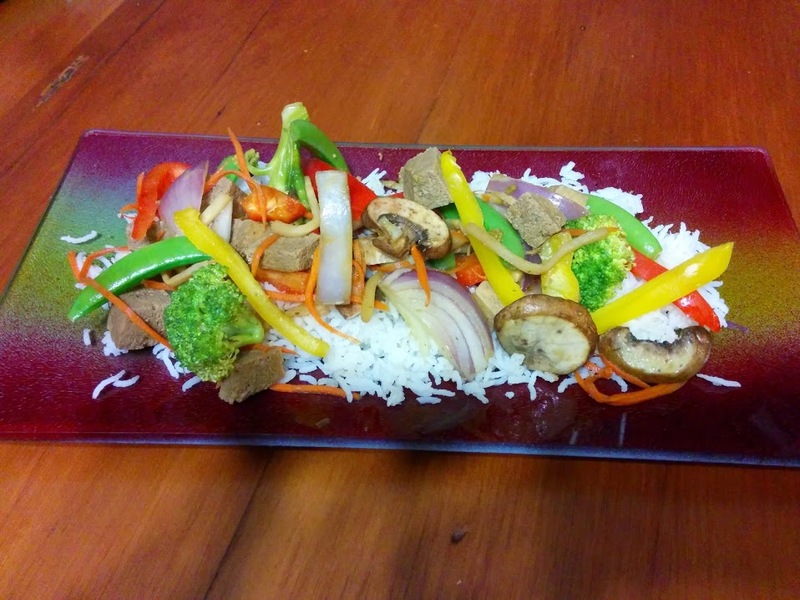 Ginger Syrup in Stir-Fry. Les Charlatans. Photo Esther Szeben. Les Charlatans Cucumber Tonic is a very unique tonic syrup, with its mix of natural quinine and cucumber flavor, heightened by a touch of tarragon. A sip of this G &T and I did the proverbial eyebrow lift and continued to happily slurp, sip my cocktail. It is springtime bottled in 250 mls. One whiff and you’ll be transported back in time to a terrace, sporting sandals and a sunhat. She recommends it in a ceviche and we mused about spring/summer flavors. I suggested it be incorporated into gazpacho soup. Orange Rum & Rosemary. Les Charlatans. Photo Esther Szeben. Her Orange and Rosemary Syrup is definitely a complex synthesis of flavors, which would bring any rum based drink to new levels. 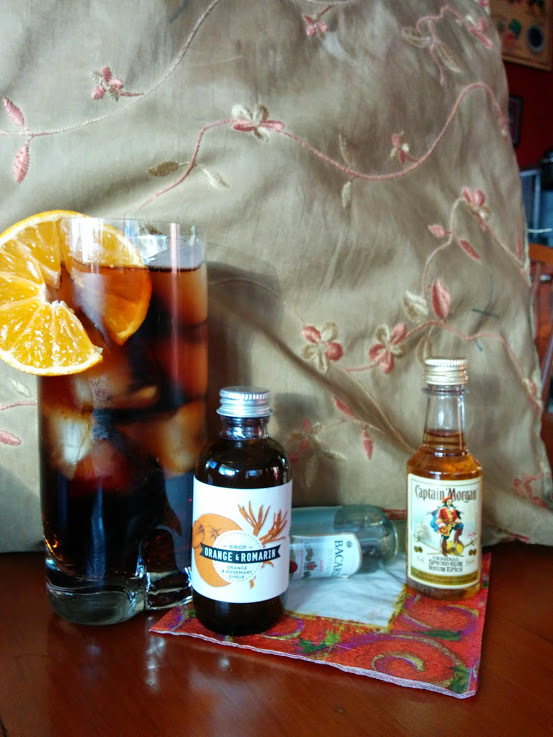 I added this to rum and cola and my classic Cuba-Libre took on a new life. “The herbal complexity it brings to the cocktail will be welcomed in most of your creations that have an orange twist.” Arti’ Choke me is a whisky based cocktail, a recipe devised by one of her friends which piqued my curiosity as it includes an apéritif I never heard of: Cynar. Do not be discouraged by the SAQ’s website. I was advised by a clerk to call your closest store as the website must be posting an inventory inaccuracy. Bloody Caesar. Les Charlatans. Photo Esther Szeben. 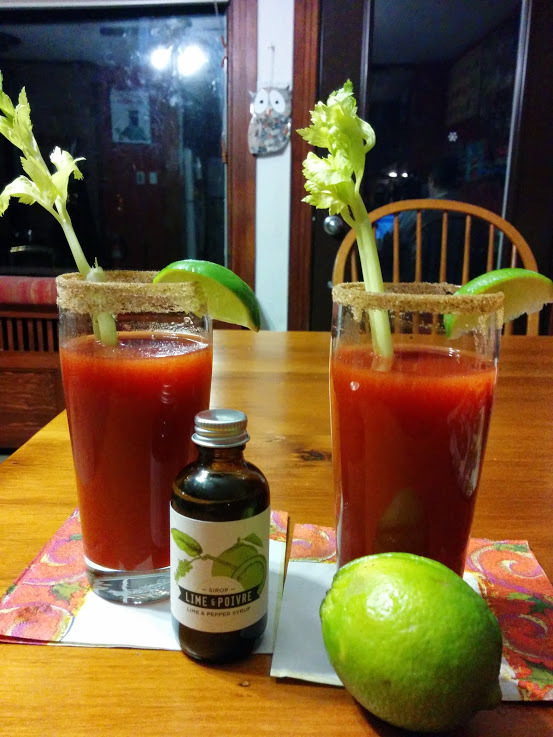 I did experiment with Bloody Caesar’s by substituting the tabasco sauce with the Lime and Pepper Syrup. The lime is subtle and the pepper is delicate. By virtue of the fact that it is in a syrup sweetened with cane sugar, it is… sweet. You might want to use it as a supplement to tabasco. I am eager to cook with in some Mexican recipes that contain avocado and coriander. Her creations have been used in vinaigrettes and enjoyed in simple desserts over vanilla ice-cream, so you don’t have to be an expert chef. The Chile & Tonka syrup “is a delicate combination of Chile Arbol (Mexican pepper) and tonka beans (contained in the fruit of Brazilian teak). The range of flavors that emerge are vanilla, currants, almonds, caramel. 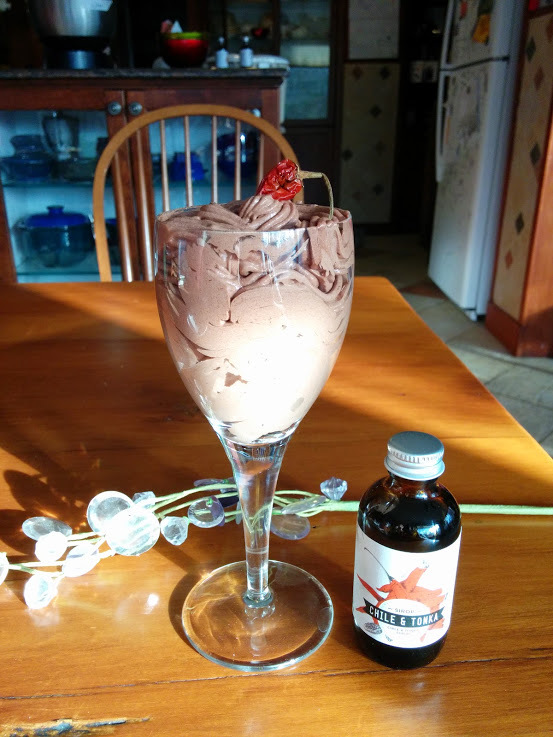 I decided to cheat with an instant Dr. Oetker Chocolate Mousse package and added about 2 tsp to bring out the chocolate and the unusual flavor of tonka with a slight bite of the pepper. Chocolate Mouse Chile & Tonka. Les Charlatans. Photo Esther Szeben. Her products include a booklet containing over a dozen unique recipes. She also hopes to offer ateliers in the New Year to help you get your creative juices flowing. Stay informed on Les Charlatans Facebook page for more on this. 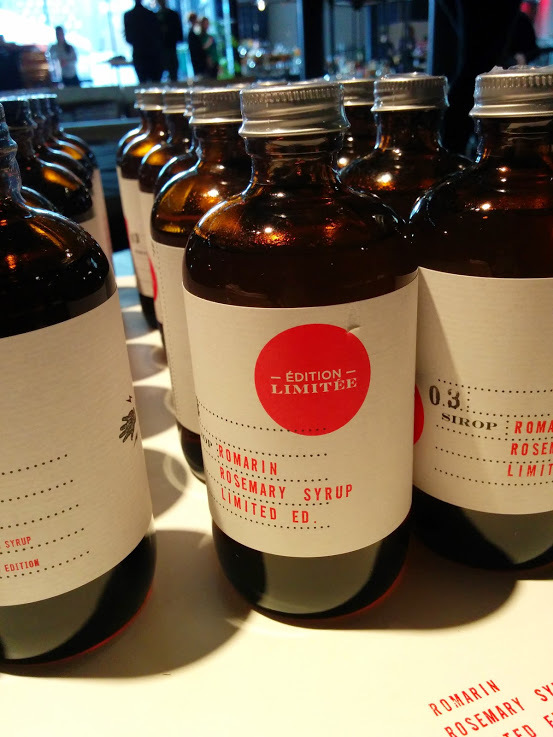 For a limited time, she will also be selling limited editions of Cardamon Coffee Syrup, Tarragon and Rosemary. Her series makes a welcome addition to my spice rack and liquor cabinet. I should probably buy two sets and keep them in their distinct locations. I like to mix it up, but I also like to keep my stock brimming. Limited Edition Rosemary. Les Charlatans. Puces Pop. Souk. PHoto Esther Szeben. Charlatans bag. Les Charlatans. Photo Esther Szeben. Souk@Sat takes place Saturday November 29 and Sunday November 30 from 12-7 p.m. at La Société des arts technologiques [SAT] (1201, boul. Saint-Laurent). Puces Pop takes place December 12-14 at Eglise St. Denis (5075 Rue Rivard). The syrups can also be purchased at several Montreal locations and online at Etsy. Visit Les Charlatans for various points of sale.